The BMW Inspection II, or major tune up, has been called everything from an inspection, 60,000 miles service, 80,000 mile service, tune-up, etc. No matter what you call it, at La Jolla Independent we have found that this service is key to keeping your BMW on the road and running reliably for years to come. These are the three basic fluids that allow the car to keep moving. Your engine oil should be replaced on a regular basis to keep all internal engine parts well lubricated and to prevent sludge build-up over time. On the side of every BMW transmission you will find the words “Lifetime Oil.” However, changing this fluid during each Inspection II has proven to lengthen the life of both Automatic and Manual transmissions. The rear differential allows the rear wheels to turn and it is equally important that this fluid be changed as heat cycles over time will deteriorate the integrity of this fluid. Some cars, mostly older, have adjustable valves. Having the proper valve clearance is essential to how your BMW performs. If valves are too tight, or too loose, this can damage the engine or have it under perform. Spark plug integrity is extremely important and insures a clean, efficient burn of the engine gasoline. While many companies claim that spark plugs last up to 100k miles, we have found that trying to stretch this interval past 25k miles can affect other engine components that are more costly than a simple spark plug. As an added benefit, studies have shown that a well tuned engine will typically get better gas mileage as well as a decrease in engine emissions. 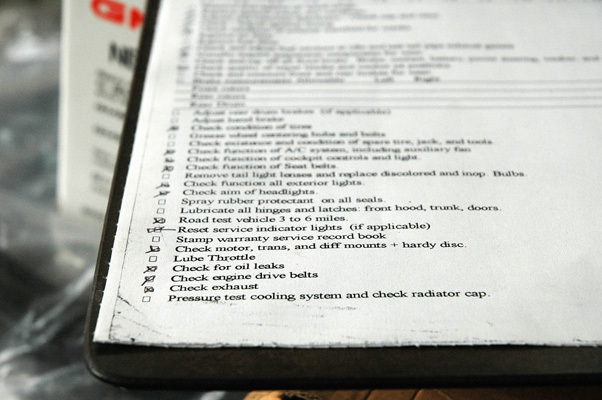 During your Inspection II, we change these items to promote both clean air and clean fuel. In San Diego, air filters tend to clog sooner due to dry, dusty weather during the Santa Ana season and especially during and after wild-fires. It is essential to have clean air entering your engine for it to run efficiently. The interior microfilter cleans the air that enters the passenger compartment when you operate your A/C or heater. Changing this filter during the Inspection II will prevent bacteria build-up in the filter and keep the air fresh in the cabin of your BMW. A new fuel filter keeps the gasoline clean of any particulate either from your gas tank or the tanks at your local gas station and promotes engine efficiency. During an Inspection II for your BMW we also provide an inspection of the entire car. We check the suspension, check the tires and set the proper pressure, look for alignment issues, and check the brakes. All mounting points for the engine, transmission and differential are inspected as well as checking your driveshaft for any faults. We also provide an overall safety inspection to make sure that all passenger restraint items are functioning properly and no issues are reported. All door hinges are lubricated and the weather-stripping treated with protectant. We also scan every single module on your car to see if there are any issues worth investigating, and re-set your ‘Inspection’ light. At La Jolla Independent we will also provide you with a detailed report of what your car needs now, and what it will need in the future. This will give you an overall picture of the health of your BMW and allow you to plan for any future repairs if needed. A proper Inspection II Service is probably the best thing that you can stay committed to during your ownership of a BMW. It keeps the car efficient, well tuned, and most importantly, you’ll be well informed. If you have any questions regarding your BMW, or the Inspection II, feel free to contact us!